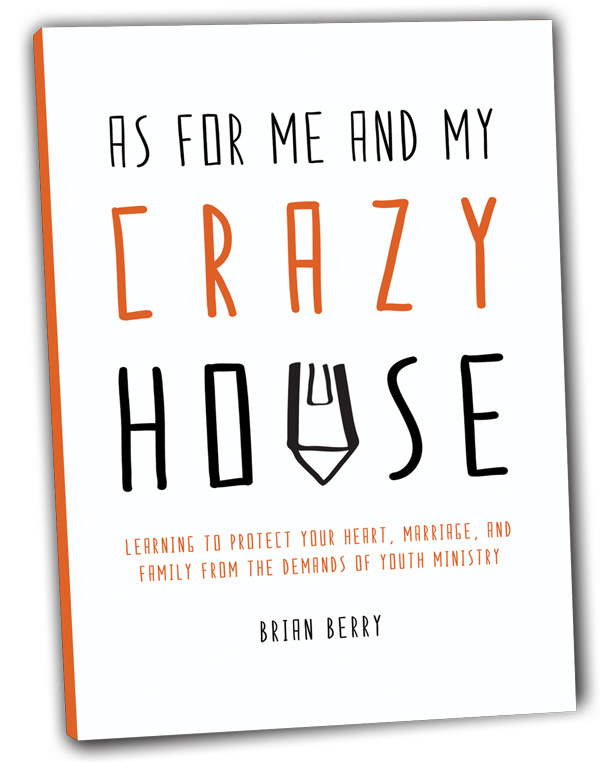 This past year at SYMC, I picked up a copy of Brian Berry’s new book As For Me and My Crazy House. Like any good student pastor, I have a bad habit of buying too many books and never finding the time to read them all, but this was a book I knew I needed to find the time to read. I’m fresh out of college and still pretty new to vocational student ministry, but have already seen the toll ministry can play on my own walk with Christ as well as my relationship with my fiancée whom I am marrying next month! If you have been in student ministry for any amount of time you probably know the negative impact ministry can sometimes have on your own heart, marriage, and family. If you have experienced that or feel it being a problem in the near future, this book is for you! The subtitle should be enough to motivate you to read it-Learning to Protect Your Heart, Marriage, and Family From the Demands of Youth Ministry. I’m not exaggerating when I say this, but this has been one of the best student ministry books I have ever read. That may come as a surprise to many because this book doesn’t reveal “the next big youth ministry model” or “a new creative way to reach students.” It’s simply a book that focuses on something so much more important than all of that-the spiritual and emotional health of yourself as the student pastor and your family. I absolutely love this because I believe the student pastor being where he needs to be spiritually, emotionally, physically, is the most important aspect of student ministry. Events, Bible studies, games, etc. can wait, making sure you are the student pastor God called you to be is more important. I recently wrote a post about this very thing (click here to view that post). In this book, Brian helps the reader see three best gifts you as the student pastor can bestow: the best gift you van give your marriage is a healthy self, the best gift you can give your family is a healthy marriage, and the best gift you can give your community and ministry is a healthy family. Throughout the book, Brian shares practical insights on how to keep yourself healthy and your family healthy when life and ministry gets crazy. I encourage anyone involved in student ministry to read this book. I especially encourage my fellow student pastors to read this. This book will challenge and motivate you to take better care of yourself as the student pastor and your family which will result in a better ministry. If there is a book you need to read this year, this is it! Click here to grab you a copy for a great price on Amazon. You can connect with Brian on his blog or follow him on Twitter. Love your site!! Love you Austin & I am Praying for you! !